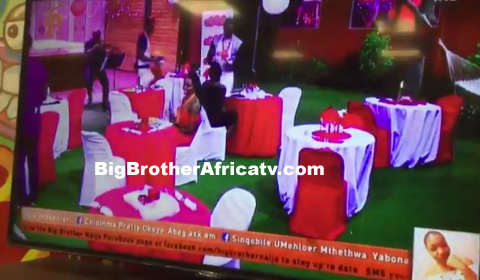 This year's Valentine’s Day was a very special one inside the Big Brother Naija house especially after Biggie made sure that our housemates celebrate this day of love with a dinner. Big Brother provided the housemates with minimie noodles and champagne to make the dinner more colorful, he also provided music which made the evening more romantic. Biggie released Housemates from the harnesses that tied them together so they could better celebrate Valentine's Day. When Head of House Khloe read his instructions for them to return to their original pairing, the news was welcome with great applause and broad smiles. All the housemates actually jumped for joy at this development. Everyone except Lolu and Cee-C who were not allowed to break their pairing. Earlier in the day there was some major friction between them as Cee-C violently cut the rope that bound her to Lolu, who was accidentally hit in the groin and had been limping since. While Khloe read further that“ Lolu and Cee-c must continue to use this opportunity to appreciate their differences and the importance of tolerance. For once, Biggie wanted Housemates to embody Nigeria's values of Unity, Peace and Progress. 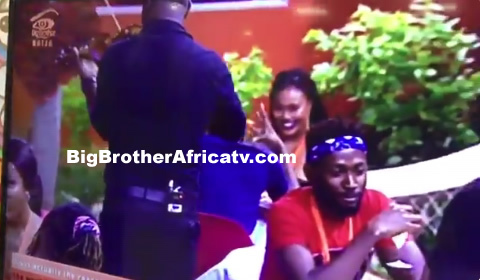 And judging by the frown on her face and the weezy breath, Cee-C was not amused, especially as this meant that Tobi and Anto who she deeply distrust would now form a pair. This week's head of house Khloe giggled even more as she continued to read Biggie’s instructions that tasked all the guys to cook up a storm for their female pairs, and not just any type of meal, one worthy of Valentine’s Day that is a creative, love-tasting dish. Mean while all the female housemates were asked to prepare themselves by dressing to kill for their best for their special partner, and bring their most glamorous self for an al fresco romantic dinner under the stars. After the pantry was emptied, Tobi gently pushed Cee-C into the storage room and they shared a long, gluttonous kiss, unaware that Lolu was still in the back of the room. Embarrassed, Lolu took a dig at them that the last time he did it was in high school. This Bigbrothernaija is entertaining but their cameramen seem old people who don't understand today's youth, theirs is outdated showing in the house hope one day you will employ young people who understand what youth is all about now of late.